This single tier cake is perfect for the new couple – you could even have it at the “head” table and then set up other cakes and desserts elsewhere. I love the look of this almost-ombre pink cake but if you aren’t a fan of pink your baker could create it in a different color scheme. You could even ditch the cake topper and turn it into a chocolate cake and it would be the perfect groom’s cake! 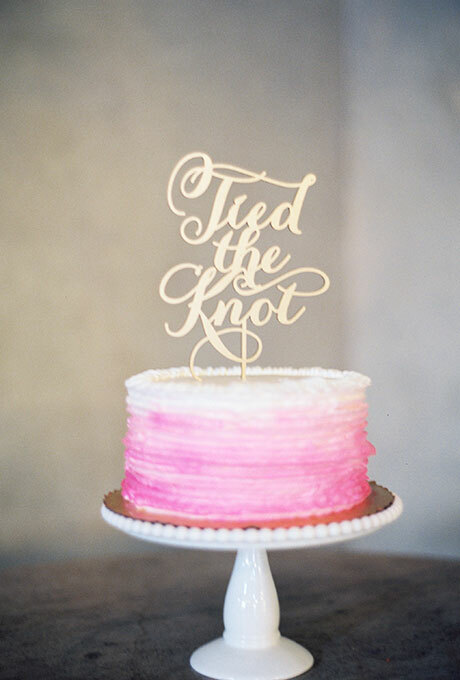 But perhaps what I love even more than the cake is the fun cake topper. If you’re having a laid-back, relaxed wedding and reception this cake topper would be ideal. You can find this whimsical cake here.